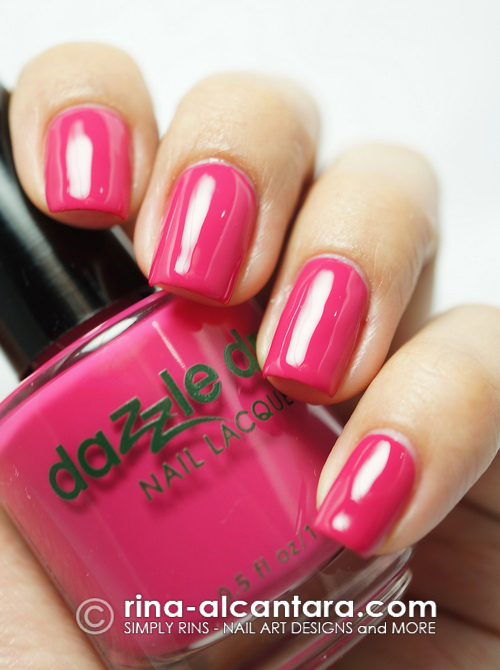 A few days ago I blogged about the Dazzle Dry Quick Dry Nail System. I was impressed by the product that I decided to put it to the test. A day before my out of town trip, I set out to create a nail art design using Dazzle Dry nail lacquers. 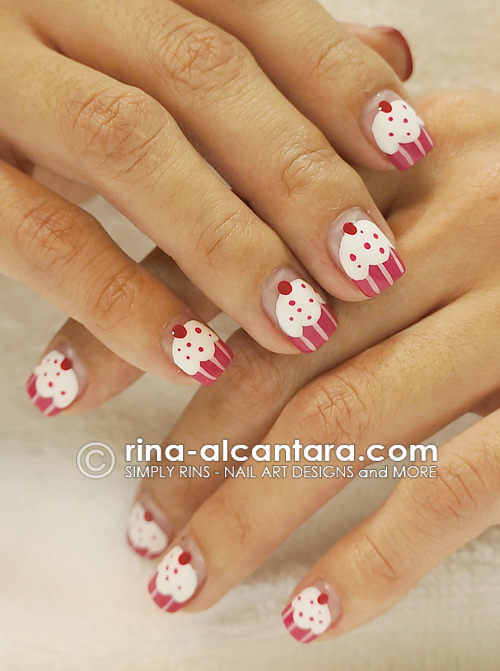 To be more specific, a few hours before my flight, I painted my toes and did my favorite cupcake nail art on my hands. I knew that I'd be wearing closed shoes on my to the airport and figured it was a good way to test the Dazzle Dry nail system promise of hard rock finish in 5 minutes. If this was absolutely true, I wouldn't have a problem wearing closed shoes after I polish my toes. Using the same argument, I shouldn't have any trouble doing a manicure/nail art an hour before I leave the house. 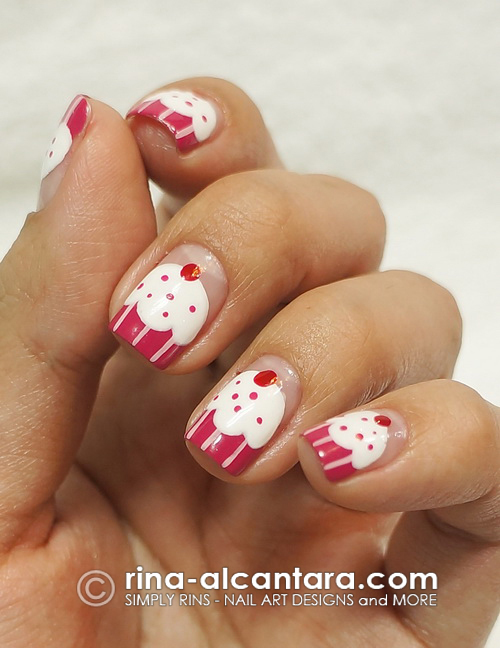 I used the pink for the cupcake holder and sprinkles, the white for the icing, and the red polish for the cherry. I also used the Dazzle Dry nail prep, base and top coat except for the light pink lines that I added as details for the cupcake holder wherein I used acrylic paint. I timed myself while doing the design and it took me approximately 45 minutes to finish both hands. I know that the Dazzle Dry Quick Dry Nail System promised rock hard dryness in 5 minutes. But because I wanted to really make sure it is dry before I finish packing last minute personal stuff into my hand carry bag, I waited another 5 minutes to use my hands. Packed the backpack I was going to hand carry. It entailed packing gadgets and coiling power cords and chargers. Zippers are worth mentioning for this scenario. I washed my hands after finalizing my carry on baggage. Added a few more things in my check-in luggage and zipped more zippers. Washed my hands for the last time before the leaving the house. This detail is important: I did all off those actions without taking a picture of my nail art. The photos I posted here were taken inside the hotel room that I am staying in at the end of the tour's first day. And behold the result! NO chipping and NO dents! I'll be taking a picture of my manicure everyday for the duration of my trip (6 days) and see what happens. I'm ready to be more dazzled. Oh, and if you're wondering about my pedicure, there were no chipping and no dents too! I'm wearing Dazzle Dry Pumped Up Purple on my toes. This is me at the Dolefil (Dole Philippines) Plantation in South Cotabato. Background is the golf course inside Kalsangi Clubhouse. The highlight of my day was harvesting a pineapple! I challenged my Dazzle Dry manicure even more by hand picking a small pineapple without minding about my polished nails. Have you ever put a manicure to the test like this one? First time to know about this top coat brand. I doubt it has landed here in Malaysia. Oh i gotta check for it. This sounds promissing... I'm curious about the endresult. If you have access to this product, I recommend that you try it and experience it for yourself. Beautiful cupkaces! :-) Beautiful post, thanks for sharing with all of us your experience with Dazzle Dry Quick Dry Nail System, it seems like a really good solution!